Why develop a React SDK? Cloudinary provides a service for a cloud based storage, manipulation and delivery of images and other media content. Thus at minimum, a Cloudinary React library would need to deliver media resources from Cloudinary, as well as define transformations on those resources. The library should also allow the developer to configure the Cloudinary service and configure the Cloudinary account (represented by the cloud_name) to deliver resources from. You will find a similar command line at the beginning of each section below. Use it to review the code described in that section. Babel - translates ES6 and JSX to the more widely supported ES5. Babel and Webpack each require a configuration file. You can see an example of the configuration at https://github.com/cloudinary/cloudinary-react/tree/library-how-to-step-1. Each component will reside in its own folder. A package.json file is also included in each folder to allow using the “import ‘./folder_name’;” syntax instead of the more verbose “import ‘./folder_name/filename’;” style. An alternative would be to have one JS file per component. When using this approach you also need to include an index.js file that exports the components. There are pros and cons to each approach, but I’ll leave that discussion for another day. Accept an image public ID (the image's unique identifier). Render an <img> tag with a constructed URL to display the image. We will start by defining a simple image component. The component will accept a cloud name, public ID and dimensions, and will then create an <img> tag to render the image. A React component can be defined as a function or as a class. 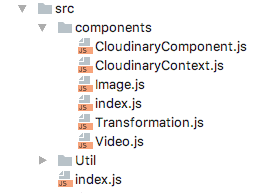 We’ll define all Cloudinary components as classes. The difference between the function and class approach is discussed here. Our component is simple enough. It declares 4 properties as well as their type and whether they are required. The render method, which is invoked whenever the component needs to be rendered, uses the properties values to generate a Cloudinary URL, and returns an <img> tag with that URL. Unlike an application, we can’t simply run our library to see the results. To test it, we’ll create a simple HTML page named “image.html” under the “samples” folder. A React component is affected by two sets of information: the properties and the state. Generally speaking, properties are public and may be set by a parent of the component. State is private and is not accessed outside the component. A Cloudinary image delivery URL may accept many parameters that affect the resulting image. Furthermore, Cloudinary keeps coming up with new options almost weekly. For these reasons, we want the component to be forward compatible - that is be able to accept new configuration options in the future. As two properties whose values are a collection of parameters. The disadvantage is that they encapsulate the actual parameters and thus make the component less readable. I think this is much nicer, don’t you? A React component’s properties must be declared. Property values are checked in development mode and will produce a warning if they are invalid. To keep the definition future-compatible, we need to automatically define all configuration and transformation properties. This is done by listing all configuration and transformation keys from the cloudinary_js library. For simplicity, we define all properties as strings. When designing the component interface (mainly, the properties of the component), you should carefully consider its utilization. For example, the developer may wish to provide attributes for the resulting tags. To allow the developer to explicitly provide the tag attributes, we will use the Transformation.toHtmlAttributes() method. This method collects all the properties that have a name that starts with “html_”, adds additional attributes calculated from the input, and returns them all as a set of HTML attributes that can be assigned to an HTML tag. The spread operator (...) is required to convert the attributes object to key=value sets for the component. A cloudinary resource can be defined using several transformations which are chained together. We can represent this chain by providing an array of objects to the transformation property. But that brings us back to the complex properties approach which we want to avoid. <Image cloudName="demo" publicId="sample" width="100" crop="scale" angle="10"
To reduce this complexity, we introduce a new component: Transformation. This is a virtual component, i.e., it does not render to the DOM/HTML. Instead, it represents a transformation that affects the image component. The Transformation component should not render a DOM node or HTML tag. But its properties should be available to the encapsulating Image component. Access to the encapsulated components is done through the children property (this.props.children). React also provides a convenience method to map over the children. You should check the type of the child before using its properties. So far we created an image component and a transformation component. We figured out a way to declare the properties of the component dynamically to support all the parameters of the underlying cloudinary_js library. We also devised a way for the image component to gather properties from its children. 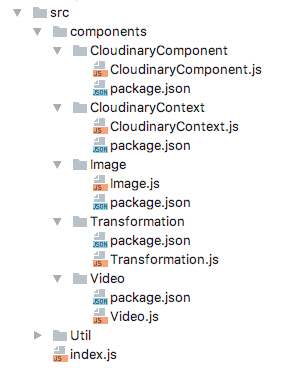 To complete the CloudinaryReact library we will need to create a video component. When you do this you will quickly realize that your are duplicating code between the components. This can be solved by moving shared code to the Util object, or by introducing a common ancestor class to both the image and video component. The React documentation advises the former method (see here and here), but we preferred the latter, as it produces a cleaner and more modular code. What’s your preference? We will also need to tie our image components to the browser’s resize event in order to provide responsive behaviour - the automatic selection of image size to fit the viewing area. Another feature that would be useful is the ability to define common configuration parameters for a group of components or the entire page. We chose to use context for this purpose even though the React documentation vehemently advises against it as it is considered to be experimental and may be removed in future releases of React. Instead they suggest using Redux or passing an entire component as a property. This may be right for an application but not for a library. The application the library is used in may not be a redux application. Passing the properties down to the children is also not practical as the components who require the information may not be direct descendents of the parent passing the configuration parameters. On the flip side, using context will require us to provide an alternative solution if the functionality is removed in a future release of React. All this, however, is beyond the scope of this post. As soon as I get a break from my coding tasks, I’ll post the next post on this subject. You can review the implementation of these ideas as well as other components in our Cloudinary React library, and of course suggest your solutions in the comments.